Sign Up with miniOrange Individual SignUp to avail Single Sign-On and Strong Authentication services provided by us !! Experience our Single Sign-On, Strong Authentication services by signing up with Consumer Sign Up. miniOrange facilitates an individual to register themselves and signing to miniOrange Self Service Console to avail our Single Sign-On, Strong Authentication products. Visit Consumer Sign Up page. Fill up the form by providing your details. Select your mobile type for 2nd-Step Verification. Click on Sign Up Now button to proceed further. If your 2nd-Step Verification Method was OTP over SMS, then while loging in you will be promted for entering OTP(One Time Password). Enter your OTP you received on your registered mobile number. 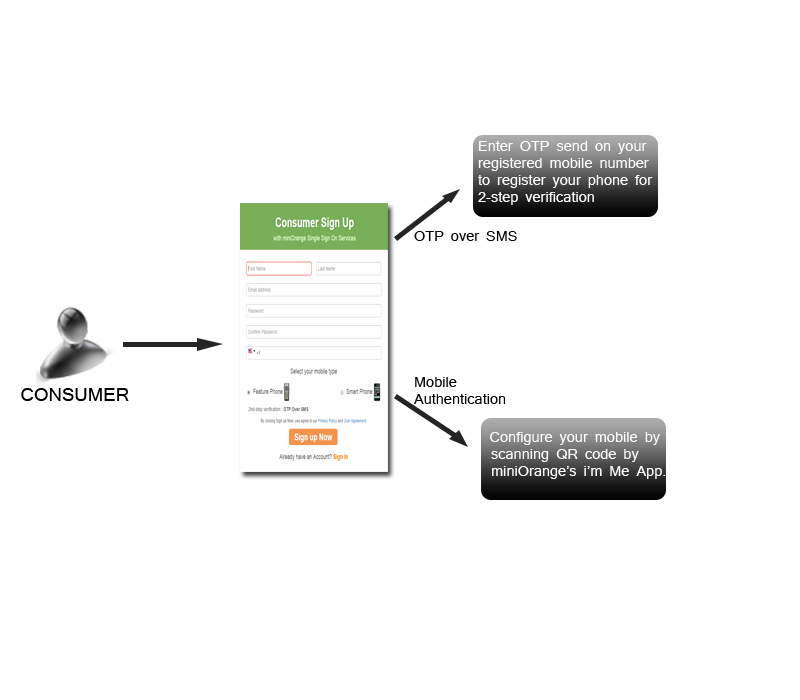 If your 2nd-Step Verification Method was Mobile Authentication, then configure your mobile by scanning the QR Code using i'm ME app. Now you can browse through all the features provided by miniOrange Self Service Console.